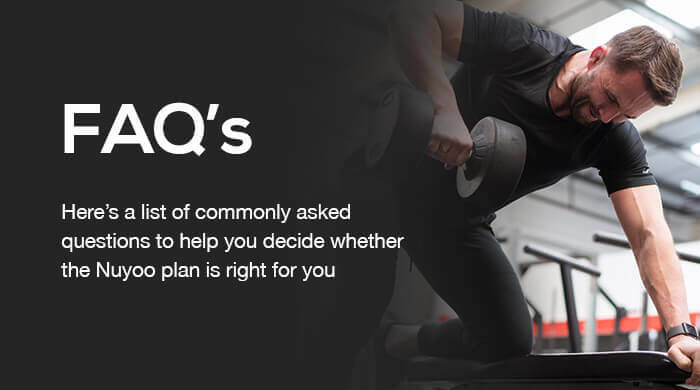 How is the Nuyoo plan tailored for me? Nuyoo is a programme created by Sacha Harding, a world class personal trainer with a deep understanding of fitness and wellbeing. With his years of knowledge as a baseline, we can use your data to programatically adapt the programme and build your ideal plan. Why do you need my measurements? The measurements you give us are essential in providing you with a plan to fit your specific needs. Using your data to adapt the programme is what separates us from reading a book. We build on the knowledge of industry experts and deliver it to you simply and effectively, thanks to the data you provide to us. Do you include vegetarian and gluten free meals in the recipe book? Yes. There are a wide range of recipes for absolutely anyone to enjoy, no matter the requirements. Can I join Nuyoo if I'm not with a gym? Of course! We want everyone to be able to take part in the Nuyoo programme. Whether you have a gym membership or not, we have plenty of workouts to accelerate your body towards your goals, be it weight loss or lean muscle mass. I have no experience with the gym, what are the workout options? Don't panic! You choose where you want to work out. If you want to stay home, you can choose a home workout for that day. If you are feeling brave enough to step inside the gym, we'll make sure it is a smooth experience. I can't exercise right now; can I still do the plan without exercise? While we recommend following the programme as closely as possible for the best results, we understand that it's not always possible to squeeze a workout into your day. However, you can still browse our huge selection of tasty recipes and track your progress as you move towards your goals. How am I being billed from my mobile? How did I sign up? You may have seen one of our advertising banners online. Once you click on a banner, you'll be taken to one of our Nuyoo landers and the Payforit payment screens. It’s a two step opt in process, on the first screen you'll see our brand, a clear cost, the payment terms and any other relevant information, along with a Purchase button. On the second screen you'll be asked to confirm that you want to make the purchase and have the charges applied to your mobile phone bill. When you've bought the item, you'll see a confirmation screen and then you'll be directed back to our site. A receipt will be sent to you in the form of a text message confirming your purchase.